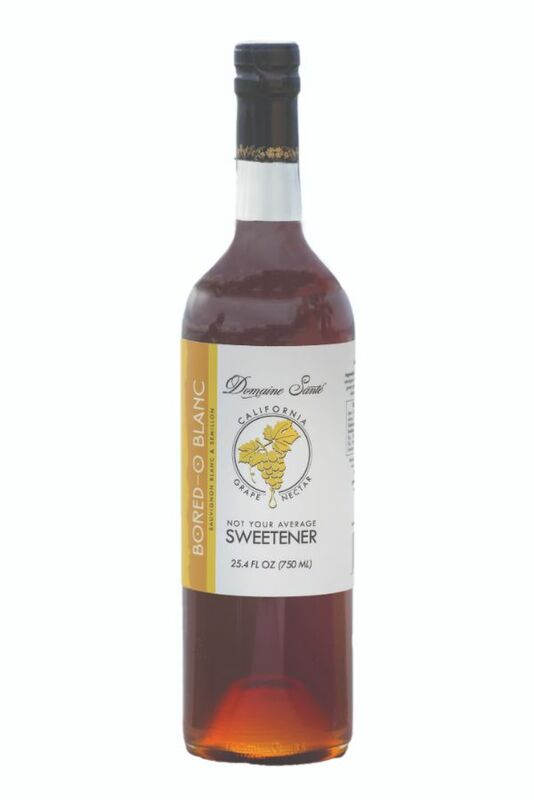 Domaine Santé is a unique, all natural sweetener made from the largest crop in California – grapes. Our BORED-O Blanc blends Sauvignon Blanc and Semillon, and takes cocktails to the next level with perfect acidity and sweetness. Liquid Sweetener made from 100% California Sauvignon Blanc and Semillon wine grapes. Production: Grapes are harvested primarily from Lodi and Mendocino; then pressed with the skins on;water is then extracted out through an evaporator at low temperature to maintain the juice quality of the grapes; blended and bottled by hand in San Diego. Tasting notes: Classic characteristics of white Bordeaux grapes; crisp and tangy; candied citrus and apple aromas; the original grape nectar; our most neutral blend and general sugar/simple syrup replacement. Cocktail suggestions: Try replacing sugar in an old fashioned or in classic daiquri.